About Facades+ The Facades+ conference series, presented to you by The Architect’s Newspaper, is a robust dialogue encompassing all things building skin. 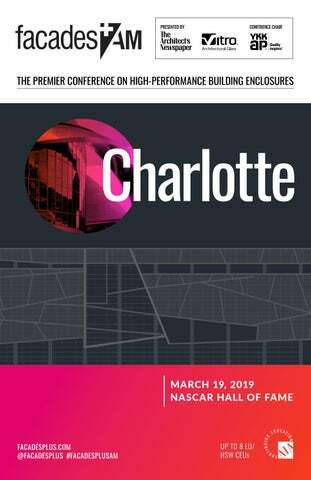 Facades+AM is a distilled, best-of edition of our Facades+ 2-day event with a strong local flair—this time tailor-made for the Charlotte area. This series of conferences and forums is currently in its eighth year and has taken place in cities across the nation. Stay up-to-date with upcoming Facades+ conferences and our weekly newsletter by signing up at facadesplus.com/subscribe. For sponsorship info contact: ddarling@archpaper.com. About The Architect’s Newspaper & AN Media AN Media serves up news and inside reports to a niche community of architects, designers, engineers, landscape architects, lighting designers, interior designers, academics, developers, contractors, and others interested in the built urban environment. 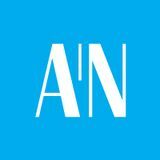 AN delivers quality news and cultural reporting through print, including The Architect’s Newspaper and AN Interior magazine, web, blog, newsletters, and social media. AN is recognized for bringing together the top echelon of AEC industry leaders in its series of Facades+ and TECH+ conferences. If you care about architecture and design, join our community and get in the know. YKK AP America is a national manufacturer of commercial façade systems for specifiers and glazing contractors seeking smart design, quality engineering and exceptional customer support. With the support of our dedicated employees, we combine controlled manufacturing and thoughtful design to provide quality building solutions that will meet your performance, aesthetic and sustainability needs. Visit archpaper.com for more information. Phone and on-site consultation for product and installation challenges. Specific fenestration and engineering courses that reward AIA CEU credit. Check at registration table to see if seats are still available. $40 including lunch. Portis crafts and organizes large teams to develop complex projects. He guides the establishment of the studio members’ collective beliefs, which are focused on being client driven and sustainably intelligent and also on designing buildings that are built to last. Senior Design Architect, Little DeBolt leads multi-disciplinary teams in all phases of design and development. His body of work includes: cultural, workplace, commercial, critical facilities, higher education, civic, master planning, retail, residential, and mixed-use, earning multiple design awards. DeBolt shares his knowledge through mentoring at Little, which also extends into his role as Chair of the AIA Charlotte’s Mentorship Exchange program since 2014. He is a visiting critic at the UNC Charlotte School of Architecture where he also was named top design student and awarded the graduate thesis award while earning his BArch and MArch. shared his research as a TED Fellow and in graduate design studios at Columbia GSAPP, Harvard GSD, the University of California, the University of Michigan, and Die Angewandte. Research Associate, UNC Charlotte School of Architecture Futrell’s research focuses on optimized daylighting design and developing better daylighting/electric lighting control systems. He has worked on numerous daylighting projects through the Daylighting + Energy Performance Lab. He is also a PhD student in UNC Charlotte’s Infrastructure and Environmental Systems program. He received a BArch and MArch from UNC Charlotte. Prior to founding Duda|Paine Architects with partner Jeff Paine, Duda worked for Cesar Pelli & Associates in New Haven. In 2017, he studied human perception in the urban environment at the American Academy in Rome. Duda was elevated to the AIA’s College of Fellows in 2012 for his approach to architectural design. He speaks frequently on design methodology, artistic collaboration in architecture, and the role of public space within private development. He has taught at the Yale School of Architecture and served as a visiting critic at M.I.T., Columbia, the Cooper Union, and UNC Charlotte. Research Associate, NC State College of Design Prior to joining NCSU in 2012, Gulling was at the University of New Mexico and Savannah College of Art and Design (SCAD). Her teaching experience and research include: graduate and undergraduate design studios; lecture courses on building materials, architectural structures, building assemblies, and systems integration; and introduction to architectural drawing. She currently teaches an advanced, interdisciplinary studio with faculty from the NC State University Department of Civil, Construction, and Environmental Engineering focusing on precast concrete. Carolina, Georgia, and the majority of Florida. He has over 10 years’ experience in the glass/fabrication industry and has been with Vitro since 2015. Hendricks is responsible for acquisitions, development, leasing, and marketing activities in Central Texas. He has led Cousins’ development effort in Austin over the past 20 years, completing in excess of 3.5 million square feet, including: Frost Bank Tower and Colorado Tower. Hendricks also led the development on several award-winning suburban projects in Austin: Motorola’s Parmer Lane Campus, Palisades West, and Research Park. Previously, he was senior vice president of the Office Building Division for the Weitzman Group. For over 26 years, Jaiyeoba has worked in the public and private sectors as a city planner and transit planner both in the United States and internationally. Jaiyeoba is a Board member of Charlotte Center City Partners (CCCP) and University City Partners (UCP), a member of the American Planning Association (APA), Women’s Transportation Seminar (WTS), and the American Public Transportation Association. In addition, he was an Adjunct Professor of Transportation Planning with the Grand Valley State University, Michigan. Prior to his role with the City of Charlotte, he was an executive for HNTB, a Charlotte infrastructure consulting firm. Director, Integrated Design Research Lab, UNC Charlotte School of Architecture Kim, Ph.D, AIA, is an Associate Professor of the School of Architecture at UNC Charlotte, teaching design studios, the sustainable facade seminar, and the building systems integration core technology course. In her role with Integrated Design Research Lab (IDRL), she oversees an interdisciplinary research platform for integrating architecture design and building technologies. President, Crescent Communities Since 2014, Leary has directed the company’s commercial and mixed-use developments across the country with an active investment and development portfolio in excess of three million square feet. Through his 22 years’ experience in real estate, he has overseen in excess of $3.5 billion in development. Marfella has over 20 years’ experience enhancing and improving people’s businesses and lives through the built environment. He has led multi-disciplinary teams and projects ranging from large-scale mixed-use development, transportation, master planning, higher education, and hospitality to corporate workplace strategies and rebranding. He is also the recipient of the McGraw Hill Design Excellence Award, the Urban Land Institute Excellence in Development Award, and numerous AIA design and sustainable design awards. Post serves as the Atlanta offce’s Transformation and Reuse Leader, specializing in adaptive reuse projects. As a registered architect with 20 years’ experience, he works collaboratively with multiple team structures and stakeholders to lead teams through all phases of design and construction. Post is involved with Atlanta’s Urban Land Institute, Center for Leadership, the AIA’s Discover Architecture after-school program, and the local National Urban Squash+Education program. He has a MArch from Columbia University. Senior Associate, BB+M Architecture Sikes has 19 years’ experience designing and managing design documentation for a wide variety of project types. His experience includes: urban infill multifamily, megascale mixed use, high rise, hotel, office, higher education, and hospitality projects. He also has extensive experience as a contract administrator during construction. At BB+M, he serves as the direct point of contact for clients and consultants for many of the firm’s larger, more complicated projects, managing the schedule, identifying all deliverables, and maintaining client relations. Architect and Sustainability Analyst, Little Todd works closely with design and engineering teams to determine the most effective combination of innovative building performance strategies. This includes ROI studies to ensure economic value as well as testing methods to maximize efficiency and the overall occupant experience. Wilson has spent 19 years in Construction Law and Commercia /Business Litigation at the Charlotte, NC, firm of Johnston, Allison & Hord, PA, where he was the Litigation Practice Group Leader. He has been twice named as one of the top 100 attorneys in the State of North Carolina and in 2009 he was named in Business North Carolina magazine as the top attorney in North Carolina for Construction Law. He is one of only 55 attorneys in the State of North Carolina that received a rating in the practice area of Commercial Litigation in the 2015 edition of the Chambers USA publication. He currently serves as the Secretary of the UNC Charlotte Board of Trustees and is a graduate of UNC Charlotte and UNC Chapel Hill Law School. Lunch will be served and up to 4 CEU credits will be provided (1–2 credits per presentation), directly following the Facades+AM forum. $40 ENTRY FEE. Registration required. Please see the registration table for more information and to sign up (space permitting). Recognized for his firestop expertise, Lacroix has over 20 years’ experience on complex high-profile projects around the world. He works closely with inspectors, glazing contractors, and curtain wall consultants during the design, fabrication, construction, and installation of curtain wall projects. Previously, Lacroix was the STI Firestop Regional Manager for the Southeastern U.S., Latin America, the Caribbean, South America, and Mexico. Jacobson has been involved in the laminated glass industry for the last 10 years, focusing on architectural applications and the photovoltaic industry. He provides training for architects, designers, engineers, and contractors on laminated glass. He also serves on ASTM and GANA committees for glazing. Andreasen is responsible for the analysis of building construction trends, as well as relationship development with market inuencers. She has previously held roles in operational process improvement, manufacturing, and product engineering with Kawneer.